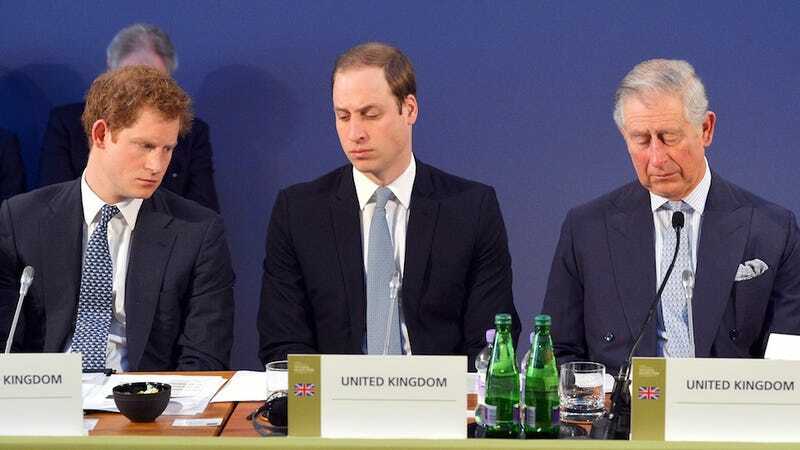 The dudes of the U.K.'s royal family, Princes Charles and William, recently attended the Illegal Wildlife Trade Conference in London and spoke out on behalf of efforts to protect endangered animals from poachers. But rumor has it William wants to go even further, by destroying all the ivory in Buckingham Palace. Veteran primatologist Jane Goodall, who turns 80 this year, told The IoS that she had spoken to Prince William and he had told her he would "like to see all the ivory owned by Buckingham Palace destroyed". The Royal Family's extensive collection includes fans, miniatures and furniture – such as the ivory throne from India, dated 1851, which belonged to Queen Victoria. The idea being, of course, to make owning ivory a taboo and undermine the demand that puts endangered animals under the gun. William's spokesman wouldn't confirm the remarks, but Prince Charles has already banished ivory items from sight at his residences. Part of the conference, the Independent reports, was urging countries to destroy their stockpiles of seized ivory and refuse any official gifts made from bits of endangered species. But it's hard to imagine that his nana, who (reportedly!) still terrorizes anyone who dares touch her nuts, wouldn't have something to say about this. She won't even let Harry keep his beard; I wonder if she's really going to let William dash through the palace with a garbage bag, chucking ivory tchotchkes. Ditto the nation's historians and antiquarians. Not to mention that maybe the royal family ought to simply return some of those treasures (like that throne) to their country of origin? His heart's in the right place, of course, but William's stance is just a little undermined by the fact that the week before the conference, he and Harry went boar hunting in Spain. Admittedly they're not endangered, but the move did inspire (according to the Daily Beast) a very irate open letter from Morrissey. Of course.